Need help with your law studies? Justice, as considered by Hart and Dworkin, two giants of Jurisprudence -- the study of Legal Philosophy -- is more than a building block. It is a fluid, evolving entity incorporating and balancing Rules, Principles, Rights and Process, in a Legal Pyramid. One of the great battles in Jurisprudence, the philosophy of Law, is between the Legal Positivists and the supporters of Natural Law. Both theories have an element of truth in them, but also questionable aspects. Yet it is quite likely that the nature of Law is a combination of at least the two schools. In this discussion, we will first look at the leading proponents of each school. For Legal Positivism, we will examine the views of the late H.L.A. Hart in his defining work, The Concept of Law, while for Natural Law, we will look at the late Ronald Dworkin’s Law’s Empire. Note that I hesitate to categorise Hart as a Legal Positivist, and Dworkin as a Natural Law proponent. While both tend to those particular schools, each legal philosopher has his own unique views. After we discuss Hart and Dworkin, thereby setting the stage for the rest of the discussion, we will present a model of Law that does not simply look at the origins of Law, but also incorporates Law as an evolving discipline. 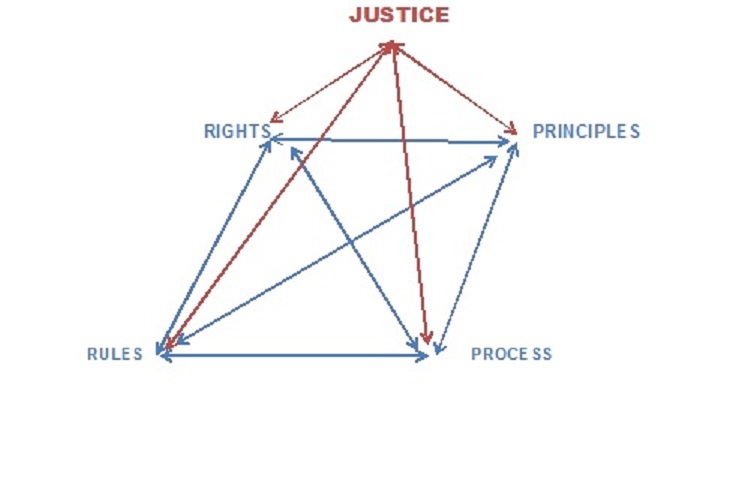 Hopefully, this model, called the Legal Pyramid, can further discussion on the development of Law. The readers are welcome to comment on the Legal Pyramid model. Hart’s view has had great influence on the legal world. Law, in Hart’s concept, starts with a basic recognition of the rules of Law, called the ‘Law of Recognition’. This Law of Recognition has no moral basis, but is founded on recognition of certain key rules. Hart, though, acknowledges a minimum level of Natural Law, without which there cannot be the level of cooperation need for a functioning society. Hart’s concept that law is a basis of rules separate from morals or principles is problematic. A Highway Traffic Act can be viewed as a set of rules to avoid chaos on the roads; but there is no moral basis to these traffic rules. However, the laws against murder or theft, for instance, do have a moral basis, whether that basis is religious or not. - Maintaining a working legal process, or “Process”. What about Justice? Justice is a feedback mechanism for the above. If a failure of rights, rules, principles or process results in a lack of Justice, then Justice acts as the mechanism to bring the Legal Pyramid back into equilibrium. The components of Rights, Rules, Principles and Process (the blue captions and lines in the square base) all interact with one another, as noted by the two-way arrows. The square shape of the relationship implies that all the blue base components are balanced against one another. The blue square base results in Justice being supported equally on all sides by equilateral triangles forming a red pyramid. If one or more of the blue base components are out of equilibrium with the other blue base components, then the square base will become rectangular, causing the sides of the red pyramid to cease to be equilateral, resulting in Justice becoming skewed, losing equality and fairness. Equilibrium would need to be re-established, re-creating the blue square-shaped base and red equilateral triangle pyramid. And thereby restoring Justice. The advantage of the Legal Pyramid Model is that it grants equal importance to Hart’s Rules, Dworkin’s Principles, as well as Rights of all the parties, and the legal Process. All need to work in the cause of Justice. While Hart and Dworkin focused on one component of the base, the reality is that Law must incorporate all of these components to maintain Justice. What are Rules? Rules can be considered the Primary Legislation (as passed by the Parliament or other Legislature), Secondary Legislation (as in the Regulations that implement the Primary Legislation), Judicial Review and Case Law. Note that Constitutional Provisions, both written and traditional (such as Conventions) can be incorporated as part of the Rules. What are Principles? Principles are moral precepts, not necessarily religious, that guide our thinking about particular cases. Both Rules and Principles can change. Racial discrimination was common in legislation and cases in the era of pre-US Civil War slavery, indeed even after with segregation cases such as the 1896 case of Plessy v Ferguson. But by 1954, Principles had changed. The Rules as they existed based in Plessy did not reflect Justice because the component of Principles had changed. The Rules in the Legal Pyramid Model had started moving away from the other base components in creating Justice, creating a rectangle base and a triangle pyramid that was no longer equilateral, but more isoceles. Justice had to be restored to being an equilateral pyramid with a square base – and that Justice was restored to its proper state by the famous case of Brown v Board to overturn segregation and Plessy. Hence, when Rules being adhered to in Law cease to reflect the views of society, also called the Principles, the Rules start to move away from Justice, requiring a change in order to re-establish equilibrium. What is Process? Process involves the Rules of Procedure and Evidence, for example. These rules can be in writing, or in actual practice. If the Process reflects Justice, then a balance is maintained. But, in many recent situations in the UK, convictions, for example of the Birmingham Six in 1975, were quashed in 1991 on appeal, due to failures of Process, namely allegations regarding the fabrication and suppression of evidence. Justice was clearly being skewed by a failure of Process, causing Process to move away from Justice, much as in the case of Rules noted above. To rectify this failure of Process, the Home Secretary to set up a Royal Commission on Criminal Justice in 1991. The commission reported in 1993. The recommendations of the commission led to the Criminal Appeal Act 1995 and the establishment of the Criminal Cases Review Commission in 1997. Process was hence improved, bringing Process back to its proper place closer to Justice, restoring the blue Square Base of the Pyramid and the equilateral pyramid sides to Justice. What are Rights? Rights can be those of the accused; or of the victims; or of witnesses; or of legal figures such as police and judges; or of society as a whole. There have been concerns in the UK regarding the rights of the accused receiving too much consideration, and those of the victims being neglected. In other words, Rights were not being distributed fairly among all the stakeholders in the legal environment. Rights, then, were moving away from Justice in the manner of the other base components discussed above. Various changes in Rules and Principles have helped to re-establish a proper balance between the Rights of the parties, in the aim of restoring Justice. For example, the Laws of Evidence have made significant changes in the process of incorporating Hearsay Evidence. Which brings up another key characteristic of the blue square Base Components of the Legal Pyramid Model. Namely, that all four Components of the Base interact with one another in order to maintain or restore the blue square base and equilateral relationship leading to Justice. Rules that are inequitable in terms of Rights can be changed to restore equilibrium by not only amending Rules, but also that of Process. Which now brings us to the apex of the Equilateral Pyramid with the Square Base. Namely, what is Justice? Justice can have many potential definitions, but let us say that Justice is a balanced result between Rules, Principles, Rights and Process. Without a proper balance between these components, Justice will be difficult to achieve. Justice, then, is a fluid, developing, ongoing balance between sometimes competing components. It is not only Hart’s Rule of Recognition, nor is it only Dworkin’s Law of Integrity. Justice is much more than a building block in our society. Justice is an evolving entity, incorporating and balancing Rules, Principles, Rights and Process. For previous Articles, please click to visit our Archive.